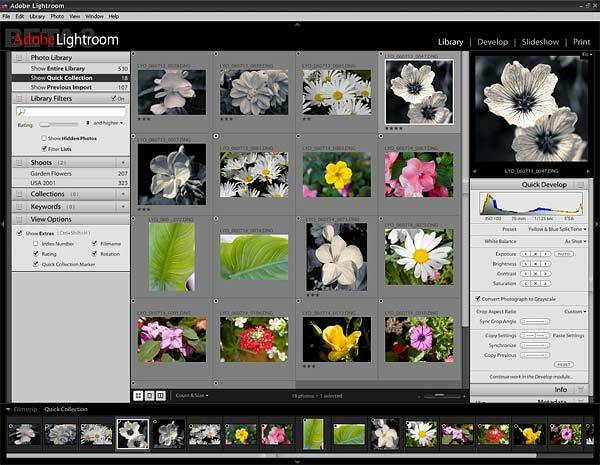 For close on 6 months Windows folk have been asking when Adobe Lightroom would be available for them to "play" with. 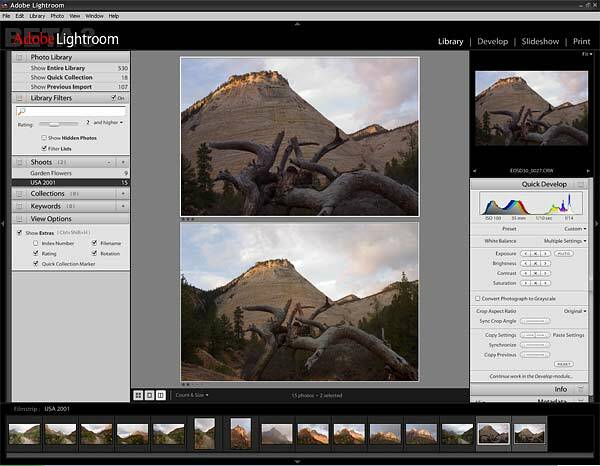 Well, I have good news - Lightroom for Windows is finally here. The question is - was it worth the wait? On my office Fujitsu LifeBook S7020 1.8GHz Pentium M with 768MB of ram I find the application a bit slow, which is more than likely due to the lower than recommended ram count. However, on my 2.66GHz P4 with 2GB of ram it runs reasonably fast. In terms of overall speed I find the Mac version a lot faster, but the Windows version will no doubt improve in the coming months. Tip: let Lightroom build all the previews before attempting to use it, otherwise it will feel slow. For your initial tests try keeping to only a few hundred images i.e. don't be tempted to import your entire picture library. Finding your way around the application should be fairly simple. On the top right corner of the Lightroom window you'll find the names of each module Module Picker), and clicking on the module name will open the module window. Along the bottom of the Lightroom window you'll find the Filmstrip panel, which can also be resized. All of the Lightroom controls are located on one of the two side panels or along the button bar just above the filmstrip panel. Images can be imported into a centrally managed Library or referenced in their current location. There is really no performance benefit associated with either, so the decision as to which is more appropriate for your workflow is best found by experimentation. However, I should warn you that images that are referenced in their current location cannot be renamed using Lightroom, which is a bit of a pain. On the plus side, Lightroom will automatically update the library to reflect any externally applied changes to file names, so I suggest that you use Adobe Bridge or a similar image browser to rename files. 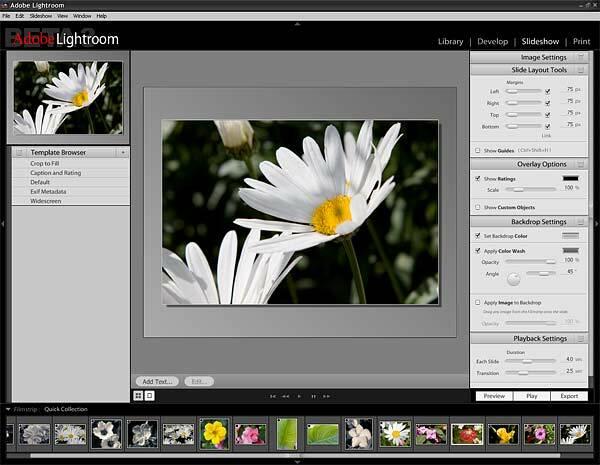 Importing images into Lightroom is relatively quick, even when converting them into DNG. Nevertheless, I've found that generating the thumbnails takes a lot longer than the Mac version. You can of course switch off Lightroom's ability to build previews in the background, but this means that the previews (high resolution images used in Loupe, 1:1 and 1:4 views) will be built when you click on the individual thumbnails. Even then the previews can be slow to generate. 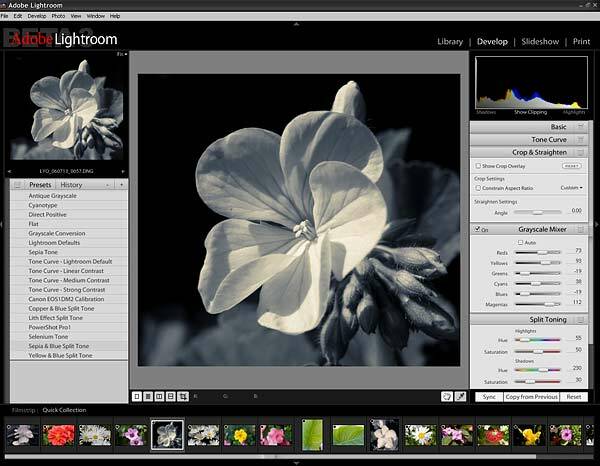 I'm sure this issue will be resolved long before Lightroom becomes a shipping product. There are three viewing options in the Library module: Grid (G), Compare (C), and Loupe (Z). The following screen-shot shows two similar images being compared in Compare view. Using the Compare feature from the mouse or keyboard is straight forward enough, requiring only that you select the images you wish to compare followed by clicking the button or hitting the C key. Alternatively, you can Shift+select the images to open them in Compare view. On the right side of the Library module you'll find the Quick Develop panel The Quick Develop panel is provided so that you can quickly select alternative White Balance and/or development Presets. 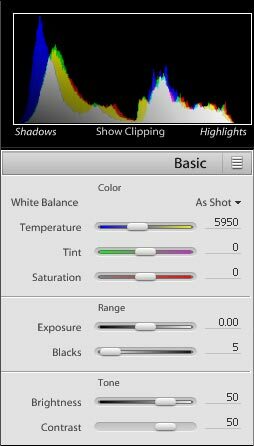 Its also allows you to make fairly crude adjustments to: Exposure, Brightness, Contrast and Saturation. 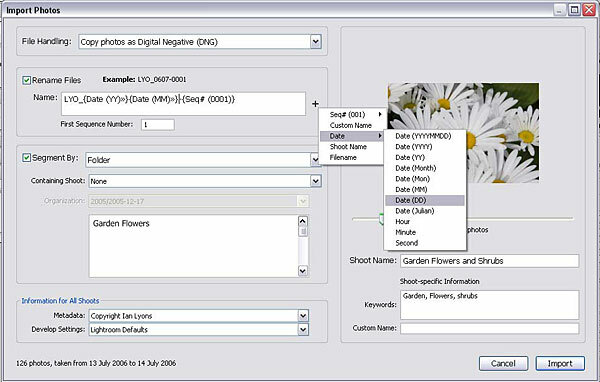 Below the Quick Develop panel you'll find panels for: inserting information such as Keywords, Captions, etc, and displaying metadata. An area of Lightroom that seems to have caused more than its fair share of confusion is how to apply the settings from one image to another or even multiple images. There are actually three ways that this can be done: Copy Settings (Ctrl+Shift+C), Synchronise and Copy from Previous (Ctrl+Alt+C). The above screenshot shows the Synchronise Settings dialog but Copy Settings uses an identical dialog. Both these options require you to use the Paste Settings command (Ctrl+Shift+V) before the selected settings are applied applied. Copy from Previous copies the settings from the last "viewed" image and pastes them to the currently selected image, which can be a real headache at times, so be careful how and when you use it. These features are replicated in the Develop module, where you'll also find appropriately named buttons. Speaking of Bridge - Bridge and Lightroom can "read" (probably more correct to write "share") each others metadata, but you need to ensure each is configured correctly. OK, so some metadata (e.g. the coloured labels) is currently Bridge specific. To get this functionality working - in Lightroom Preferences (File Management) you should have "Automatically writes changes into XMP sidecar files" activated. With this setting activated Lightroom will record all of your metadata (rating, keywords etc) and it's own adjustments settings into an XMP sidecar. However, at this time Lightroom adjustments cannot be read Camera Raw and vice versa. Bridge also appears to have some difficulty in reading Lightroom applied keywords, but ratings are readable. Also remember deactivate "Ignore sidecar XMP files" in Camera Raw Preferences (see Edit menu) if you're using DNG rather than proprietary raw files. Metadata written into XMP sidecars by Bridge can also be read by Lightroom - select the files in Lightroom, then from the Library module's Photo>XMP sidecar menu choose "Import metadata from XMP sidecar file". Since the Lightroom library does not auto refresh you'll need to use the Import XMP any time you change metadata in Bridge. Another aspect of the Lightroom library that has been annoying Mac users is the lack of any ability to synchronise their library across multiple computers. Sadly this issue will not be going away any time soon, so some users have developed workarounds. A tutorial describing one such workaround can be found at Creating a Unitary Library and Managing Off-line Images. 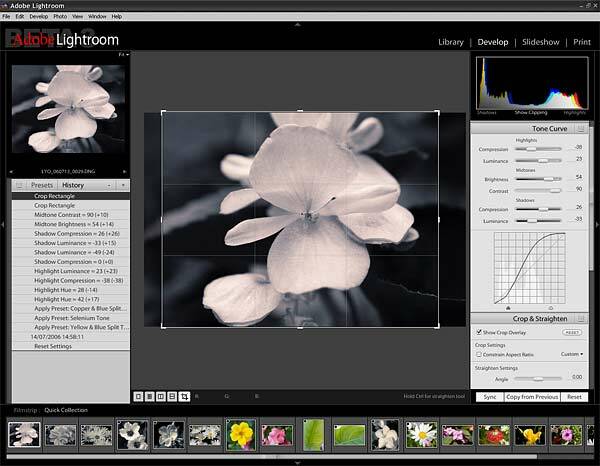 The Develop module has Adobe Camera Raw at its heart, but the Lightroom team have extended it's functionality to the extent that many will find it so powerful as to render Photoshop only of limited importance in their workflow. 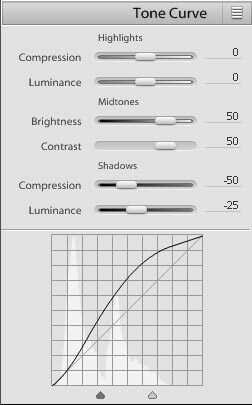 As mentioned above Lightroom has a very comprehensive range of images adjustment controls, which are augmented by user definable Presets and the History feature. Some replicate the functionality of Adobe Camera Raw, which includes holding down the Alt key to see those areas where the highlight/shadow clipping will occur. 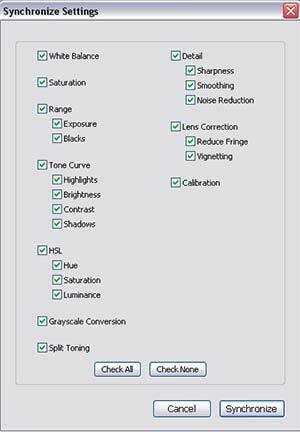 In particular features such as: Greyscale Mixer, Split Toning, HSL Colour Tuning are now consider must-have features for Camera Raw 4. History was a was important feature introduced with Beta 3 for the Mac, but it doesn't seem to have captured the attention of many users. If you hit the + symbol a date/time stamp or History Checkpoint (similar to Photoshop snapshot) is created. These checkpoints can be used as "pseudo-Versions or Renditions", meaning that a single RAW image can have multiple "renditions" (i.e. one image with multiple sets of settings denoted by the history date/time stamp (red asterisk above). You can then hover the mouse backwards and forwards over the checkpoints, whilst at the same time watching the effect in the Navigator preview. Once you see the version you're looking for simply click the relevant date/time stamp and the main preview will reflect the settings that had been saved into the history checkpoint. Since first getting my hands on Lightroom I've had a great deal of fun with the Split Toning feature, creating my own presets for effects such as: Selenium, Sepia & Blue, Copper & Blue, and Yellow & Blue, all of which were favourites when I processed my prints in the "wet darkroom". I also find the cropping and straighten tools in Lightroom much more friendly than Camera Raw. 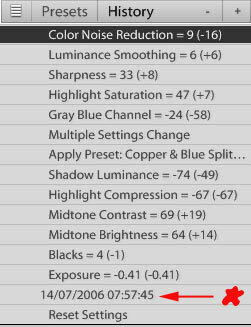 The Lightroom adjustment panels have borrowed a number keyboard modifiers from Adobe Camera Raw. For example, holding down the Alt key whilst dragging the Exposure/Blacks slider will activate the "Clipping Display". The Alt key can also be used when dragging the Red/Green and Blue/Yellow colour fringe sliders in the Lens Corrections panel. Last but not least, holding down the Alt key when dragging a Hue slider in the Split Tones panel lets you preview the Highlight and Shadow Hue at 100% saturation. Lightroom does not have a Save file option but instead uses the concept of Export. 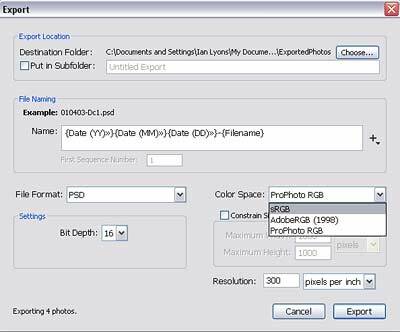 The Export function is used to: name, define bit depth, file format, resolution and colour space profile for your images much in the same way as save, but without ever touching the original. Important features that are not available on either platform include: Perspective Cropping, Spotting or Healing tool, Red-eye removal, and Selective Editing tools such as Dodge and Burn - hopefully we'll get them soon. So far a the Slideshow module is concerned I think Beta 3 was a backward step in so far as some of the output options are now missing. It also has some pretty obscure functionality that has left many Mac users scratching their. Nevertheless, it is a useful feature and one that shows a lot of promise for the future. Slideshow Module - what, no music! The Readme file tells us that exporting a Slideshow to PDF can take a long time, especially if more than 50 images are selected. 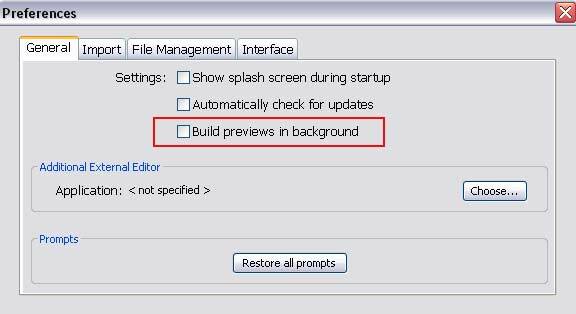 It also recommend that you don't attempt to use the exported PDF file until the Activity Window is empty. The progress bar on the task erroneously shows 100% complete, instead of progressing while the task is working - this particular issue confused a lot of Mac users at first. The Readme file describes some problems associated with printer colour management, but users will probably find a few other things that confuse them. The following screenshot shows the built-in templates for Contact Sheets, but you can configure alternative arrangements as need be. Letting Lightroom manage the colour handling and profiles is by far the best approach, but it's also a tad complicated to set up at first. However, once you have it set up the way you want it then simply save out Presets. These presets are what make printing from Lightroom a pleasure rather than a toil (Photoshop Team - are you paying attention?). 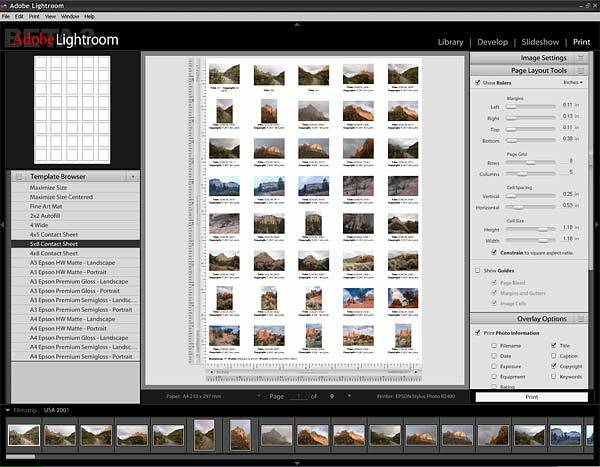 Selecting the Media Profile that Lightroom will use. 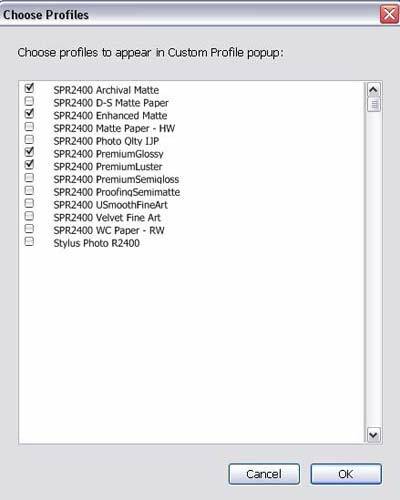 Once it's fully up to spec I think Windows users will LOVE the Lightroom Print module, but in the meantime, don't be expecting perfectly colour matched prints unless you're using good quality ICC profiles with your printer.